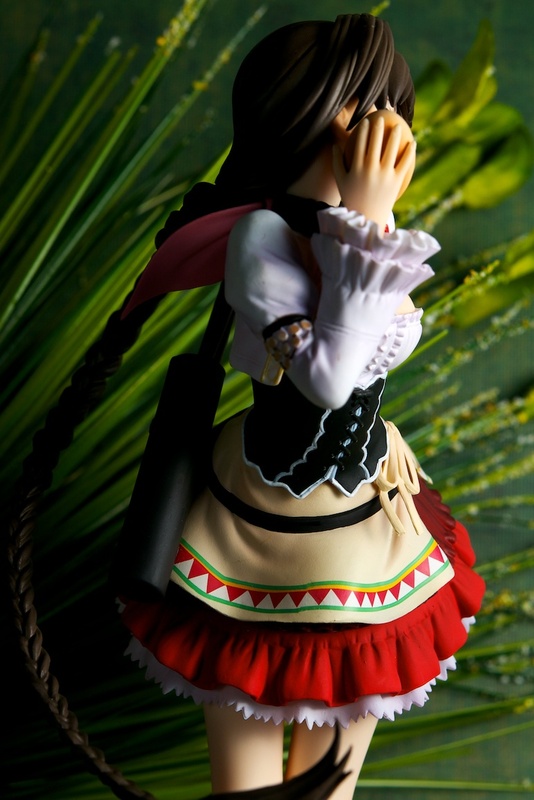 Neris is but one of a small flood of Shining Hearts figures to hit the market in the past nine months or so. The lion’s share of those have been handled by Kotobukiya, but there have been a couple from Yamato and the lone Xiao Mei from Max Factory. Neris has the dubious distinction of being the only Japanese shop exclusive from Shining Hearts to date. Shining Hearts is a SEGA title and part of the greater body of work that is the Shining series that started back in the Genesis days. Those early 16-bit titles, particularly Shining Force II, stand as my earliest introductions to the SRPG genre and were also one of the few reasons why I might (slightly) have regretted selecting the SNES over the Genesis as my one and only 16-bit console. In the intervening time since its early 90’s debut, SEGA has throughly ran the Shining series into the ground, as it has a noted talent for doing. Most recent entries to the series lose the tactical elements of the early games, ship to lackluster reviews, and hardly any have made their way out of Japan. If there’s been a silver lining in the fall of the Shining series, it would have to be the fact that Tony Taka has taken over character design duties for the most recent titles (Tears, Wind, Hearts, and the soon-to-be-released Blade). Tony has contributed some gorgeous artwork and character designs to the series–documented in the excellent Tony’s ART Works from Shining World artbook, which also received a very nicely done localization by Udon Entertainment. While his work may not have saved the series from further decline, I suspect he did at least succeed in making it more successful from a merchandising perspective. I was a bit hesitant in preordering Neris for a couple reasons. For one, there’s the obvious exclusive tax which added about 2,167 JPY (Big in Japan price) on top of the forget-about-any-discounts price of 9,333 JPY. In Neris’s case, there was also an unwanted surprise at release time when a couple “extras” (namely, a wall scroll and bath poster) forced an upgrade from a fairly reasonable 1,390 JPY for Registered SAL service to the lofty sum of 4,000 JPY for EMS. All told, Neris ran me a tad over $200 (USD) shipped, which is a king’s ransom for a 1/8 scale PVC. There was also my previous history with Kotobukiya weighing on the purchasing decision. 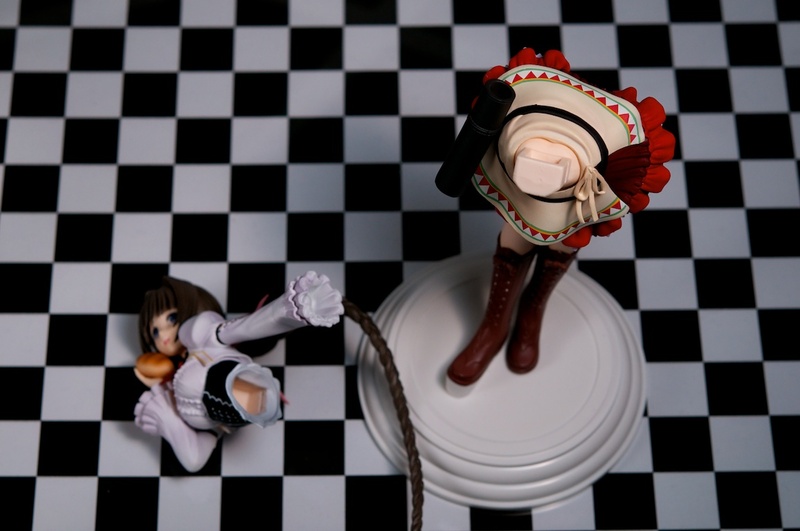 I only owned two Koto figures at the time–wizard’s robe Blanc Neige and swimsuit Corticarte–neither of which I hold in particularly high regard. As such, I was a bit reluctant to throw large amounts of money their way again for fear of another disappointment. On the other hand, it had also been a couple years since my last Koto purchase and I figured they deserved another shot. I had high hopes that Neris would manage to restore some of my faith in Kotobukiya so I could buy from them with confidence again in the future. Reservations aside, Neris wears with a cute Bavarian maid outfit that, combined with her pose and expression, gives her a playful demeanor. She carries a bread basket in her left hand that can be swapped out for a bow and arrows. Even with weapon in hand, Neris retains an air of innocence. The pose has few, if any, bad angles, though this is another figure with the glossy-eyed look that I’m starting to dread as a photographer, so I had trouble lighting Neris from certain directions. Kotobukiya did outfit Neris with a cast-off implement, which allows one to display her sans skirt and reveal a pair of pink shimapan underneath. The cast-off feature was a bit of a surprise to me, as I did not see it advertised anywhere in the pre-release material, but the seam where the torso and lower body meet is well hidden beneath Neris’s non-removable corset, so I can’t really complain much about its presence. Quality-wise, Neris is subtly disappointing. At a reasonable viewing distance of 12 inches or so, she looks pretty good. Move in closer–or with the aide of a macro lens–and it becomes evident that the sculpt and paint work has a roughness that I’m unaccustomed to seeing from the likes of Alter or Good Smile Company. It’s a problem I’ve seen with my other Koto figures and something I had really hoped that they would have fixed by now, especially on their high-priced exclusives. The display base doesn’t earn Kotobukiya any points, either. It’s completely unadorned (no logo or anything) white plastic with a simple bevel design. Neris comes pre-affixed, possibly permanently, to the base, so it’s secure enough, but the lack of ambition in the presentation just furthers my impression that Kotobukiya is content with getting by rather than pushing the envelope. Am I being too hard on Kotobukiya here? I’d like to hear some opinions from others. 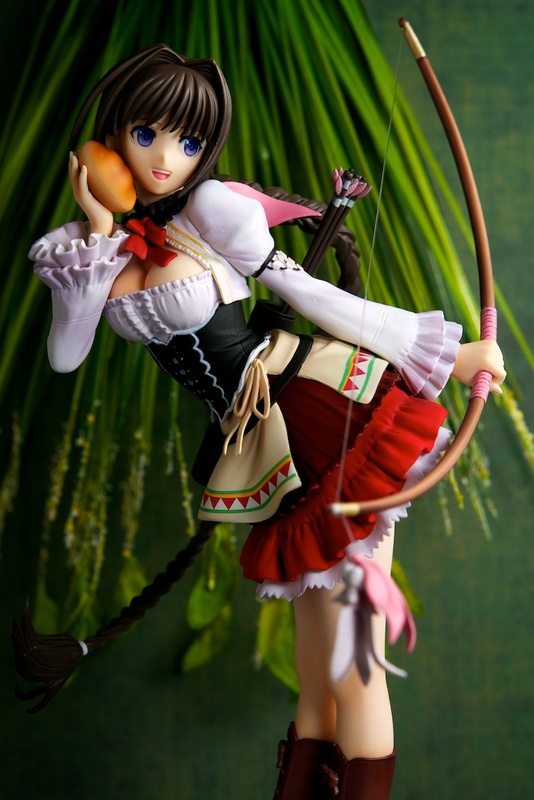 This entry was posted in Figures, Reviews and tagged 1/8 scale, Exclusive, Kotobukiya, Neris, PVC, Shining Hearts. Bookmark the permalink. From your pictures I can’t really see the flaws, but I know what you mean, you paid a bit much for her. Well, I also considered to get her, but the exclusive tag, said I should better pass. They should have made a normal run for her, the fanbase for her was obviously there. Maaryan and Nymph but sometimes they are not that good as these two. Exclusive figures should be a piece of art in my opinion, but sometimes they just have the purpose to get extra money from figure collectors. Kotobukiya’s exclusive figure are more of the second kind, I own their exclusive Marisa, she’s nice but there are some noticeable flaws. FWIW, I picked up their 4-Leaves Tamaki on the cheap just before the holidays. I’ve yet to open the box and inspect her, but the ratings on her over at MFC are pretty good, so hopefully I’ll be happy with how she turns out. I got to admit that when opened the page and saw that it was a Shinning Hearts figure I was a bit weary since so far I haven’t been impressed by any of the figures I’ve seen of it. But this one really is nice from your photos. I can’t really see the imperfections you speak of from just looking at the pictures though. I do think that $200 is a bit much for her. At least you got some extras. I like this type of outfit. The corset and the frills really bring out the curves on her. I didn’t expect the shimapan, they’re very nice as well. Didn’t expect her to be cast off either, shows of her shimapan clearly haha. Hmm I didn’t consider that the glossy eyes would be hard to light, however i think they look very nice. 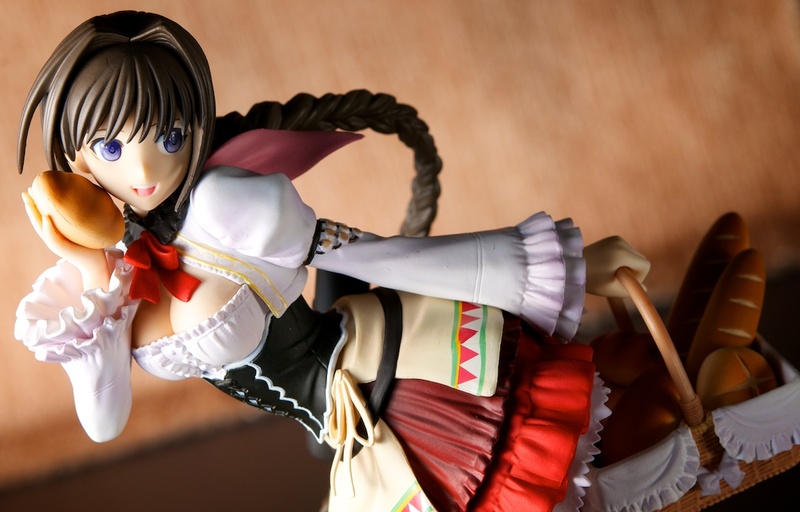 There have certainly been quite a few Shining Hearts figures already and a lot of them have been pretty ho-hum. I thought Neris looked better than most and I ended up grabbing her, despite the fact that she was expensive, because she was build-to-order and I didn’t want to miss out in case she turned out really good. I think it’s generally hard to see paint and sculpt issues in photos unless they’re really close up. If anywhere, I think you might be able to see what I’m talking about in pic #4. It’s also quite likely that I’m more sensitive to certain aspects of craftsmanship than others. The outfit is quite nice. It’s pretty much what makes the figure. Without it, I don’t think Neris would have much left to differentiate herself from other characters. I’ve wondered if I’m the only one having trouble photographing glossy eyes, because I don’t see anyone else complaining about it. If you read the Strobist blog, they do talk about the problem of shooting someone wearing eyeglasses, which I suppose is basically the same issue. Really nice pictures! She blended in very well with you background quite well ^^. I don’t think Kotobukiya holds GSC or Alter standards either. But they seem to have many “nice from a distance” figures. I’m not sure as I actually dont have any Kotobukiyas, so it’s mostly a review based opinion. ^^ I’m kind of interested in Rufina actually, who looks quite good, though I’m not sure. Still, Neris looks very sweet. I like her clothing and also do find her legs attractive… Speaking of her legs. There were no pictures of her feet and the base you didn’t like. By the way! I’ve been visiting your blog a few times, and I think you should make a page where readers could see a list of all your reviews, rather than scrolling-to-find. That would be awesome! It’s true that Neris looks decent at a normal viewing distance. I probably tend to put Kotobukiya’s work under the microscope more than Alter or GSC just because I’ve been disappointed with their products in the past. I would probably be more forgiving of the quality if Neris had been a budget-priced figure, which is the case for many of Koto’s normal run figures (at least with Koto US pricing). I tend to frame a lot of my shots relatively close up such that limbs and legs frequently get cropped out. This is mostly stylistic license, because (1) I tend to find close-ups more appealing, and (2) I find the display base to be something of an immersion breaker (i.e., a reminder that you’re looking at a plastic figurine). In the case of the Neris shots, specifically, I was using some card stock that measures only about 12″ square, so I really couldn’t frame it much wider without hitting the edge of the backdrop. I’m pretty jealous of your Neris. I would’ve gotten her if I had the expendable income but sadly other pre-orders took priority. But man…would’ve been nice to have that plastic bread. I certainly can’t recommend Neris as a value proposition. 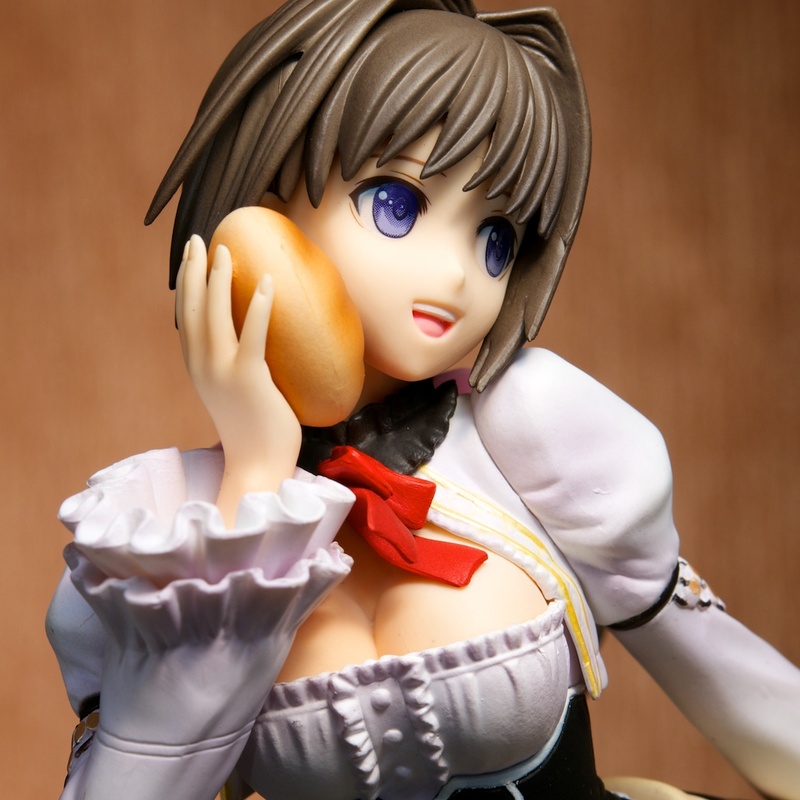 She’s essentially the same quality as Koto’s normal 1/8 scale figures at twice the price. 😕 To be fair, shipping contributed a lot to the cost and if you were so inclined you could drop the wall scroll and poster to avoid mandatory EMS shipping. I recently buy Neris figure, but how can i cast off her skirt? her waist joint? The joint is actually where her top (corset/blouse) ends and her skirt begins (see here). I seem to recall that she actually came with a piece of plastic stuck between the torso and her lower body that had to be removed during the unboxing stage, but you might not have received her this way if you bought an opened figure. Try gently rocking the torso piece from side to side while pulling it away from the bottom. With some patience and a little finesse, it should come apart without damage. That’s odd. My Neris wasn’t glued down. Well, I’m glad you got it sorted without damaging anything.